This trail follows the Disa River up as far as a beautiful waterfall. It is named after the red disa orchids which flower on the cliff faces. A boardwalk with a seat has been built near the waterfall. The Disa Kloof Trail is a favourite walk on a hot windy day when the south easter blows. This trail is set amongst shady trees next to the Disa River. 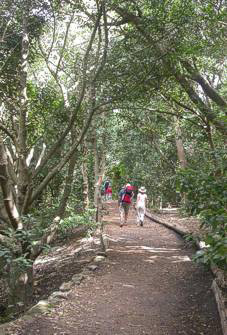 This is a very easy short trail – 950 m from the entrance to its destination at the waterfall, about 30 minutes each way. It leads along the western side of the Garden, over the Olive May Porter Bridge, and into a wooded area which is a haven for many bird species. This whole route is accessible for wheelchair users and parents with little ones in pushchairs. The Boekenhout Bridge crosses the gulley where the path was washed away in extraordinarily heavy rains in April 2005. Observant visitors may still be able to see evidence of one of the soil slips which occurred at the time. All the regrowth on the slip is natural and has not been assisted in any way. Toilets are located nearby for our visitors’ convenience. Winding beneath the big trees growing alongside the water’s edge, the trail crosses the z-shaped Disa River Bridge and leads up to a lovely waterfall. The dam created above the Bobbejaanskop Bridge weir provides beautiful reflections of the surrounding mountains and this is where, if you are lucky, you may see a pair of the shy African black duck. The cliffs on the west side of the river provide a home for the red disa (Disa uniflora), the Western Cape Province’s floral emblem, which flowers from late December to late January. An ancient bee hive is hidden behind the trees next to the cliff. Also found in this section of the Garden is the chacma baboon and the angulate tortoise. Baboons are social creatures which move about in troops in the mountains and the Garden looking for food. They dig up bulbs and roots and will pull out the succulent centres of palmiet and other bulbous shoots. They also break off young protea buds in order to eat the soft base of the flower heads. They enjoy various fruits, seeds, insects and other invertebrates and will even eat the young of other animals such as antelope, hares, mice and birds. They are not averse to raiding bins or gate-crashing a picnic. It is very important not to feed them as they then become problem/ dangerous animals and may have to be put down. The angulate tortoise is found along the Cape coastal belt and occurs naturally in this area. It has an undivided gular scute (bony ridge) below the throat which is larger in the males and which they use to fight one another in breeding season. Females lay a single egg, unlike the mountain or leopard tortoise which lays batches of 6-15 eggs. Sometimes these latter tortoises, which have been confiscated from unlawful owners, are released in the Garden and may be seen roaming around the lawns and beds during summer.